I’ve been told I love to ramble on, so why not pass along some of my ramblings from this past month. I hope everyone’s summer has been filled with sun and fun! I know here in Central Florida, we are having our usual daily downpours, high humidity and plenty of sunshine to enjoy every day. I was hearing from my friends back in Missouri how hot it was and that the mosquitoes were at an all time worse. Has it been really hot where you live? It’s hot here, so what do you do in Florida to cool off? You go to the beach! 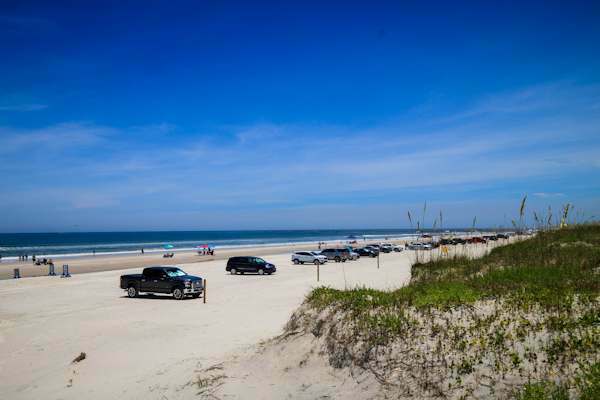 If you are heading south to enjoy beach time, check out the Daytona Beach area. We went to the Port Orange beach area. It’s at the end of the beach areas you can drive on. What we love about it is your car is right there and all your beach stuff is right there when you need it. No parking blocks away and carrying all your items to the beach. If you do make your way to the Florida East Coast, be sure to check out what else is in the area. Even though the weather is HOT here, I have one tomato plant in the garden which is bursting with little round sweet red jewels. We can’t keep up with all the cherry tomatoes from our Everglade Cherry Tomato plant. Folks, this variety of tomato plant is one of the easiest tomato plants I have ever grown. It seems the hotter it gets, the more it produces. Nature kept the plant watered for me. Usually, in July, my garden is sun solarizing for the summer and I don’t have any veggie plants left. We are also raising Monarch Butterflies. If you have never done this before, give it a try. Plant some milkweed around your home and watch the Monarchs lay their eggs there. Milkweed is their ONLY food/host source and I grow my milkweed from seed which is another easy plant to grow. I also made a Blackberry Cobbler in my skillet with all the blackberries I had in the freezer from our bush on July 4th. I served it with some homemade ice cream. Yum. If you have never made homemade ice cream, you must give a try. I use this ice cream maker. 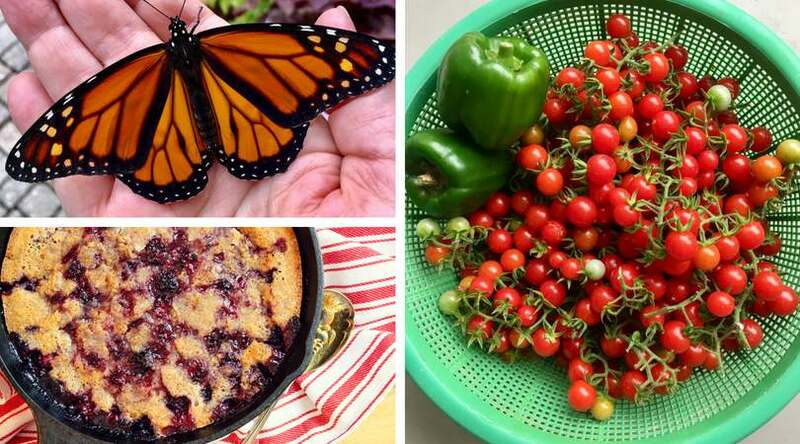 Right now is the best time to use up all those garden veggies you have so much of right now. Squash and zucchini are such a great summer crop. I love to make Squash Casserole with my bounty and this recipe also freezes very well. Set up your casseroles in foil pans and set in the freezer. Great to take to a friend or neighbor or heat up for unexpected guests. I know its the middle of summer but I just had to tell you this. Start stockpiling on popcorn and hot chocolate and mark your calendar, because you’re in for a movie marathon this holiday season. Entertainment Weekly reports that the Hallmark Channel, along with its sister network Hallmark Movies & Mysteries, will to air a record 34 new original Christmas movies in 2018. I am such a sucker for Hallmark Christmas movies. I love listening to one of these movies while I decorate the Christmas tree. Always puts me in the Christmas spirit. « Looking for a new laptop? It’s hot here in SC too! We love Florida and when I was growing up in South GA, we always vacationed in the Daytona Beach area or Panama City Beach. My husband and I just returned from two weeks on an island in the Caribbean and I always love those tradewinds. Your tomatoes look awesome and so delicious! It is hot where I live too. For us there is not a beach that is all that close so typically we will go hang out at the pool. It sounds like where you live it is a lot of fun with all sorts of beaches around. I would love to grow some routes myself. Fresh fruit and vegetables are so tasty. Love your garden harvest. I wish I would have planted more cherry tomato plants in my garden this year. I’ve never been to Florida but hope to go someday. I also live in Missouri and this summer has been awful! I’m trying to keep my flowers and vegetables alive by watering them every other day. I always loved driving on the beach in Daytona. It’s been so long since I was there. I went to school at the University of Florida and it was always a favorite spot. Summers aren’t so hot her in the northeast. Yum, I would love a blackberry cobbler right about now! And I love the beach. It’s so relaxing. I have never been to Daytona Beach before. I’m a rambler too! haha All of your food shots are making me so hungry. Everything sounds tasty. I have actually never had squash casserole! I am not a huge squash fan, but we normally grill ours when we have squash as a dinner side. Yesssss indeed, it’s hot here in MI! Our veggies have been blooming pretty good, I really need to take some time to make a blackberry cobbler. Its been a long time since I’ve baked anything to be honest, I’ve been grilling a lot. My sister lives near Daytona beach and we when visit her we always make a trip to the beach, so relaxing! This squash casserole looks perfect for my bounty of squashes! I am going to pin this recipe for later. Your tomato plant sure is providing you lots of tomatoes. It’s so great that you have your own tomato garden. We love cherry tomatoes for snacking and for any light recipe. It’s a true gift from nature. Its kind of hot where we are, but really coming from Phoenix Arizona, now living in Colorado, I just can’t call the 80’s hot. I have AC so I can always get away from it. Anway, your tomatoes look so good, just like you can pop them in your mouth right from the vine! Summer’s definitely not here to play! The weather’s been crazy hot and it’s not easy to take it unless you stay in and overuse your air conditioner. It’s really important to think of ways to beat the heat. Your tomatoes are awesome! I love homemade ice cream! If I live in the beach area like Florida, I would be there everyday lol. Then again, you have to worry about the flesh eating bacteria, isn’t that a scare thing out there? Hi Chubskulit, the disease you are talking about happens in ponds where it doesn’t have moving water all the time and the water gets really hot. The ocean doesn’t do that. So swimming in the ocean is fine, but not ponds in the summertime. Thanks for stopping by. so so hot this year i love it. when we plan our vacation florida keeps coming to mind. i love that your car is right there with you. makes for a much more enjoyable day. Gotta love going to the beach! We’re actually going to Florida next week and can’t wait to hit those beautiful beaches. I’m such a fan of Hallmark movies. I need my fix. I haven’t seen any in months! Beach is always a great idea especially when its Summer season. Probably my happy place. I never know about raising butterflies so I guess I need to look forward on your future post about Monarch Butterflies.